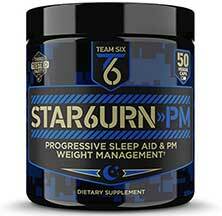 Team Six Star6urn-PM is a progressive sleep aid and night-time weight management supplement made somewhere in America for Team Six Supplements. It’s unclear what the history of this company is or how long they have been trading, but registration records show the company website was first registered during the summer of 2017. So the chances are they are a newcomer to the game or a company that has been trading previously under a different name. The Team Six website does a good job of extolling the benefits of the various health and fitness supplements the company has to offer (currently 6), but does not provide any contact details or a company information page. Nor is it possible to buy any supplements from the site. People who want to buy Team Six supplements can only do so via Amazon. This is not a standard diet pill, but the benefits it’s designed to offer should be the same for women as they are for men. The best diet pills provide a combination of benefits that help people to lose weight. Fighting the flab is their primary aim. Team Six Star6urn-PM is intended to alleviate stress, help people to drop off sooner at night, enjoy a better quality of sleep, and wake up feeling nice and refreshed. If it does what it’s supposed to do, during the periods of sleep the body will be busy burning fat. In theory, if the product can increase the basal metabolic rate, the body could very well burn a few extra calories while sleeping, but the amount of weight loss provided would likely to be negligible and the weight would only stay off if the daily routine involved a sufficiently calorie-reduced diet. In general, when people experience the calorie shortage that is necessary to trigger the need to burn fat there is a danger that a small amount of muscle tissue may be lost as well. Team Six Star6urn-PM is also alleged to prevent this from happening. It all sounds good in theory, so let’s take a look at the ingredients and see if the claims are likely to pan-out. Garcinia Cambogia (60% HCA) (300mg): A respected fat burning fruit extract. The active compound, hydroxycitric acid (HCA) encourages fat loss by suppressing the appetite and reducing the body’s ability to create fresh stores of fat. In order to work, garcinia cambogia extracts have to be at least 60% HCA. This one does, so we’re off to a good start. KSM-66 (300mg): A patent protected ashwagandha extract. It’s unlikely to work any differently to other Ashwagandha extracts, but the benefits normally associated with the ingredient include reduction of stress, fatigue, and insomnia. It’s an ingredient that has lots of potential and very little research-backed proof that it works. Green Coffee Bean Extract (250mg): The active compound (chlorogenic acid) in green coffee bean is good for preventing sugar urges and is even better at burning the body’s stores of fat. InnoSlim (250mg): A proprietary blend developed by NuLiv Science. It provides a combination of panax ginseng root and astragalus membranaceus root. InnoSlim is designed to provide appetite suppression and stimulant-free fat burning, but we were unable to find any studies that prove it can do these things. Mucuna Pruriens (150mg): An ingredient that may prevent stress-induced weight gain. During periods of stress, cortisol levels become elevated. This triggers an insulin spike that can cause the blood sugar to drop suddenly, triggering a desire for foods that are sugar laden or high in fat. Mucuna pruriens controls cortisol, thereby preventing the knock-on effects that can be so bad for the waistline. It also encourages improvements in muscle tissue by giving testosterone levels a boost. Magnesium (30mg): Research shows magnesium is involved in several biological events that effect muscle function including energy production and oxygen uptake from the blood. Melatonin (5mg): The hormone that governs sleep. If night-time melatonin levels are not high enough sleep does not come easy. No prizes for guessing the reason for its inclusion here. Bioperine (5mg): A branded black pepper extract that provides piperine. This is the alkaloid that makes pepper smell so distinctive. Piperine-providing compounds are added to supplements because piperine helps other ingredients be absorbed more easily. Usage Guidelines – Two capsules are required each evening, shortly before going to bed. Usage can be continued up to a maximum of eight weeks. Team Six Star6urn-PM is not intended for people under 18-years-old. Team Six also point out the formulation is unsuitable for pregnant and nursing mothers, and all potential users are told to get a doctor’s approval prior to commencing use of the product. This is doubly important for people who have medical issues or are using any form of medication. All sales are processed via Amazon.com and no international shipping options are available; so Team Six Star6urn-PM appears to be a product that’s exclusively available to residents of the USA. The ingredient profile is good and a lot of customers appear to love the product, but reviews suggest most people are using this product like a sleeping pill and that’s all it really is. Sure, there are a few extra whistles and bells, and it may help a few people to snooze away a few extra pounds, but let’s wake up and smell the coffee here. As a weight loss aid, Star6urn-PM does not compare well to the leading products of the day and there there isn’t even a money back guarantee. If you need a sleep aid, you probably just found your ticket. But if you need to do something about your weight there are other options that offer more help.